Fr. Vazken Movsesian's sermon on forgiveness as a prelude to healing, and the Bread of Life (John 6). Includes the Mr. Potato Head story and the "Atheists in Birthing Rooms" truth. 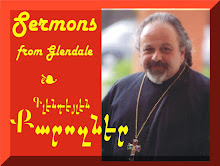 Sermon delivered and recorded LIVE on August 4, 2013 at the St. Peter Armenian Church & Youth Ministries Center, Glendale, CA.